Add some sparkle to your decor with this gold finish crystal glass lamp, which features a rhinestone trim shade. An elegant look from the Vienna Full Spectrum brand, the Flora table lamp offers sparkle and bling for any room. The design features clear crystal glass elements set against a gold finish metal column and base. Up top is a fabric shade with gold trim encrusted with rhinestone elements for added bling. 25 1/4" high overall. Bottom base is 5" wide. Shade is 11 1/4" across the top x 13 3/4" across the bottom x 9 1/4" high. Weighs 4.85 lbs. Flora crystal table lamp from the Vienna Full Spectrum brand of lighting. Clear crystal glass elements. Gold finish metal construciton. 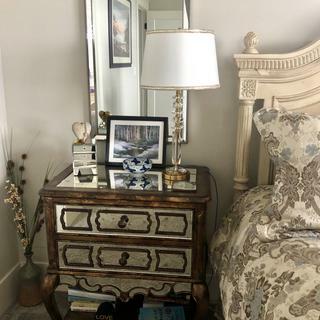 Fabric shade with gold trim. Trim has rhinetsone accents for sparkle. BEST ANSWER: The shades are designed with plastic rhinestones. 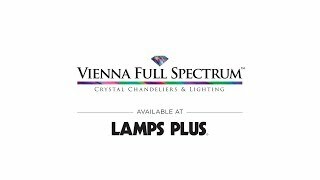 I'm looking to purchase two of the Flora Gold and Crystal Table Lamp by Vienna Full Spectrum - Style # 58A83 lamps but I'm not too sure we will like the shades that come with this lamp. Can you recommend a replacement shade? BEST ANSWER: Our lighting specialists would be happy to find you the perfect components. They can be reached via chat or phone (877-704-2425). I bought two of these lamps for our nightstands. They are beautiful and I love the bling on the shade. One lamp had some defective trim and Lamps Plus ordered a replacement shade which arrived quickly and was perfect. Very happy with these lamps. Only downside would be if you want a three-way as these are only on/off switches. Just right for my bedroom dresser!